Tagline: Fantasy and history will meet. Person and person will meet. Person and heaven will meet. 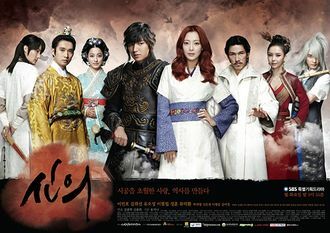 This drama shows the romance between a warrior from the ancient times and a female doctor from the modern times, their love transcending time and space. It will also tell the story about the process of making a true king. Yoo Eun Soo is a 33-year old plastic surgeon in the year 2012. She was originally a general surgeon, but quickly found that it was an overworked, under-paid profession and jumped ship to plastic surgery. Her dream is to someday open her own practice. One day, Choi Young kidnaps her and takes her back to the Goryeo era, requesting that she use her medical skills to save the life of the Queen. Their ensuing love story is a long journey of faith that spans centuries and transforms them both, as Eun Soo finds true purpose in her medical knowledge for the first time while Young is inspired to live again through Eun Soo's determination, indefatigable cheerfulness and love of life. This page was last edited on 15 April 2017, at 06:19.